Interview With: Lola Olaore - A member of the Mayor’s Digital Pioneers network. Lola is a Technology Analyst for a global consulting firm and is a member of the Mayor’s Digital Pioneers network. 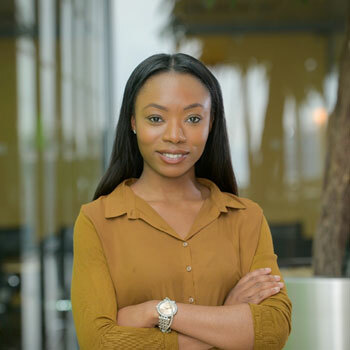 She is taking an active role in supporting the Mayor’s Digital Talent programme as she is passionate about inspiring her peers to pursue a career in technology. My journey to this role was strange; I am from a non technical background and I graduated from university with a 1st class degree in Global business. I decided to take a gap year before my final year where I was awarded a scholarship to study Mandarin and went travelling. Upon my return I applied for an eight-week mentorship programme at one of the world’s largest search engine companies. After several assessment stages I was accepted on the programme. This was the first insight into technology for me as my plan after university was to get a job in wealth management. After this mentorship programme I applied to an insight evening for women in technology by my current firm and I was inspired to get into technology after a speech from a female managing director who explained that technology needs more women. I decided to apply for the graduate scheme and I was accepted. During this time I also applied for a coding school which was fully funded for women, and in this course myself and my team were able to create a dynamic website in 8 weeks as well as attending technology events that focused on coding, Virtual reality, Fintech and artificial intelligence.I decided to apply as I want to be a female leader in technology and show that you don’t have to be a male to do it. These are free community course so why not apply, learn to code whilst meeting other females who share the same interest as you. Meet up/Eventbrite: I think I attend at least 2 FREE events each week regarding all things tech, from understanding Fintech to Artificial intelligence and events that simply celebrate females in tech. These events are a great source into gaining insight into the tech industry as well as meeting cool people and trying out tech related products. Insight days: Many companies offer insight days where you can come along to their office and understand from an organisation’s perspective what they are doing in the tech space from project and clients they work with, highlighting case studies and meeting people who work in the tech industry. Ps. This is how I got into tech! Online schools: If don’t feel like attending courses there are several FREE online platforms to help you learn various technologies such as w3School and YouTube. My organisation also invests in an online platform called pluralsight which is a great platform especially if you want to go at your own pace. For the younger audience:A few of my colleagues’ volunteer at these afterschool clubs, search for one in your local area if you have one, attend… if you don’t get one created. Lastly, my biggest tips is believe in yourself, you will be surrounded by people who have been in the industry for many years, but don’t be intimated, technology is growing fast, new technologies pop up every couple of days everyone is constantly learning.